For our most recent update, please go here. The following is an updated and edited version of our earlier post, Death and Distress at Sunset Cliffs, 2005 – 2015. The beautiful Sunset Cliffs that stretch from the residential southern portions of Ocean Beach to the lower reaches of the uninhabited sections of Point Loma are certainly a world-renown, indescribably gorgeous treasure of nature that line the land’s border with the Pacific. At the right moment when the ocean earns its name and the Cliffs earn theirs, the beauty and serenity cannot be amply replicated by the pen – or keyboard. Yet these same cliffs with their jagged rocks and crashing surf are also very unforgiving in their encounters with unwary humans, where death, distress and major trauma accompany their collision with this abrupt edge between ocean and peninsula. Aerial view of the end of the residential neighborhood at Ladera Street and Sunset Cliffs. The author played and camped in this area as a teenager and Boy Scout during the early 1960s. Growing up near the cliffs as a teenager, learning to surf off a protruding point of land of Luscums, and being a resident of OB since the late Sixties, I’ve been well aware of how the cliffs and surrounding waters can claim lives, through either falls or drownings. While a teenager, I recall a 3 year-old daughter of a San Diego Union columnist being lost over the cliffs. A classmate of mine at Point Loma High died in a surfing accident in the waves of Ocean Beach just yards from the lifeguard station. While working on Newport Avenue in the early 1970s, I recall that a sailor was killed when the cave he was digging in along the cliffs collapsed, leaving only his dangling foot protruding from the cave’s opening. This was in either 1973 or ’74. Deaths, drownings, distress and rescues at Sunset Cliffs are so common that we at the OB Rag took up the project of attempting to chronicle those incidents that have occurred over the last dozen years or so – from 2005 through 2017 – thirteen years. What we found is both disturbing in the numbers of deaths and serious injuries, as well as it confirms our fears of the dangers of these glorious cliffs. To construct our chronicle, we dredged the internet for news stories, particularly from the San Diego U-T and a few online posts of local TV stations. We also acknowledge that there appears to be plenty of gaps in our chronicle, so it is a work-in-progress (and we invite anyone to contribute to it). We found that there has been at least an average of 5 deaths or serious injuries every year during that period. Yet, we believe this figure is extremely low as locals who live along or near Sunset Cliffs swear they hear the sirens of rescue vehicles daily. Our research is imperfect partly because many rescues, we believe, do not make it to the news, and are not reported to the public. And it’s imperfect particularly for the earlier years of our survey. Perhaps mainstream media is paying more attention to cliff rescues especially since jumps off the Cliffs near Osprey Street are dramatically increasing. Also the reported dates may be off a day or 2 from the actual date of the occurrences. Rescue at Sunset Cliffs, April 1, 2010. Photo by Jim Grant. Also, just to be clear, our chronicle only includes deaths and serious injuries or conditions, as well as rescues. It does not include boat or panga rescues off the cliffs; nor does it include drownings off the beach – such as the Halloween drowning of OB resident Scott Bowles. Neither does it include the many rescues off the beach or the OB Pier – such as the recent “rescue” of a naked pier jumper, although it does include the drowning death of a young man who jumped off the Pier. It also does not include drownings or injuries on Point Loma’s bay side. So, here is the start of the chronicle – and importantly, we feel it’s not complete as more research needs to be done. A missing scuba diver’s body was discovered off Sunset Cliffs, and was identified as a 54 year old man from Carlsbad – a moderately experienced diver. He was reportedly diving in 60 to 80 feet of water in a spot known for its kelp beds when he did not resurface with his diving partner. A surfer was forced into a cave by waves and held prisoner by the pounding surf before San Diego lifeguards rescued him yesterday. The 53-year-old man from Honolulu was surfing off Osprey Point when he became trapped against the cliffs. A surfer battered by high tides and surf below Sunset Cliffs was pulled from the water unconscious and could not be revived. He was a 53-year-old man visiting from New Jersey. Lifeguards were summoned to the spot offshore below Point Loma Nazarene University. A 60-year-old man drowned in the Sunset Cliffs area despite rescue efforts by other swimmers, lifeguards and paramedics. San Diego lifeguards received reports of a person in distress just north of Osprey Point. Initially, 2 beachgoers swam out to assist him and dragged him into a nearby cove, where they began cardiopulmonary resuscitation. A 35-year-old woman was rescued from an ocean bluff at Sunset Cliffs after she fell and broke a leg. The incident happen at the foot of Ladera Street. She had fallen10 feet from the top of the cliffs and was taken to a hospital. A Clairemont man, 29, who spent the night in the ocean after his kayak sank was rescued from a beach south of Sunset Cliffs — some 17 hours after he began and about five miles away. He was suffering from extreme hypothermia when he was found on the beach in the part of Point Loma known as Wooded Area. A 60-year-old San Diego man died after he was pulled from the water in Sunset Cliffs. The man had jumped into the water from an outcropping of land near Sunset Cliffs Blvd near Adair Street just after 6 p.m. and then appeared to be having difficulty. After he was rescued, he collapsed on the beach. An OB woman fell off the cliffs, and her body was found at the bottom of a cliff off Sunset Cliffs Boulevard in an area where her family and friends said she loved to walk, about a half-mile from her home on Orchard Street in Ocean Beach. A 23-year-old man suffered a head injury when he jumped into the water at Sunset Cliffs. The man dived off a 20-foot cliff at the foot of Del Monte Avenue and hit his head on rocks in the water. The man had cuts on the top of his head. 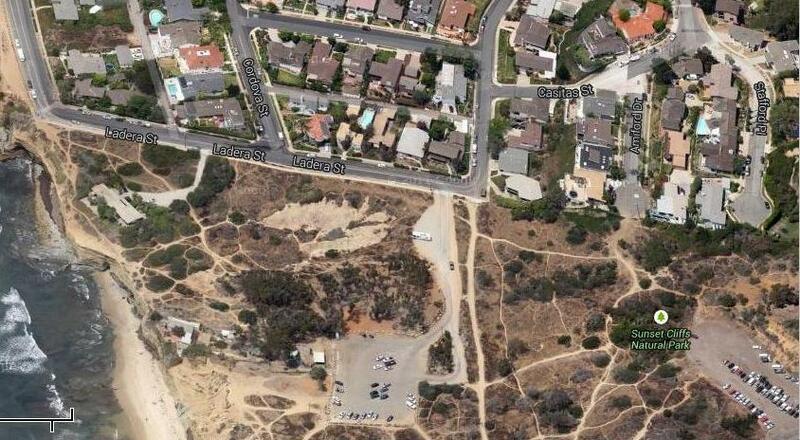 Two men were critically injured after falling 50 to 60 feet off a bluff at Sunset Cliffs. A rescue helicopter airlifted one of the men to an ambulance and flew the second man to a hospital. A Point Loman credits other surfers for rescuing him while on a surfing trip near Sunset Cliffs. Doctors think the 61 year old may have ha a heart attack while paddling out. The surfers he was with held him until lifeguards came to his rescue, hauled him onto a boat and transported him to Mission Bay where he was taken to a hospital. A 16-year-old boy was rescued via helicopter off Sunset Cliffs due to injuries after a friend jumped from a cliff and landed on top of him while he was in the water, near Sunset Cliffs Boulevard and Osprey Street. A 24-year-old man suffered head injuries when he jumped into the ocean at Sunset Cliffs. The man hit his head on a rock below the water’s surface after jumping 25 feet to 30 feet into the ocean at low tide, off Sunset Cliffs Boulevard at Osprey Street. A bystander came to the aid of the man, who was unconscious. A motorist drove over a bluff in Sunset Cliffs landing wheels down on the sand in a small cove below. The driver was able to get out of the car on his own following the impact, below the parking lot off Sunset Cliffs Boulevard at Osprey Street. It appeared the back end of the four-door car hit the rocks as it plunged down the cliff, estimated at 35 to 40 feet high. A 25-year-old woman who was visiting San Diego from Chicago fell from Sunset Cliffs and died. She was believed to have been taking a photo of the sunset when ground beneath her gave way and she fell 40 to 50 feet. Several bystanders tried to revive Anna Bachman, but paramedics confirmed her death when they arrived. A 27-year-old man fell to his death from a four-story-tall sea bluff while visiting Sunset Cliffs with friends in the wee hours of the morning. A 911 call was made shortly before 4 a.m. to report the accident near the terminus of Ladera Street. Emergency personnel found the man at the foot of a roughly 40-foot bluff, and crews put his body on a litter and used a rope-and-pulley system to bring it up to street level. The victim’s friends told authorities he was walking along the edge of the precipice when he lost his footing. 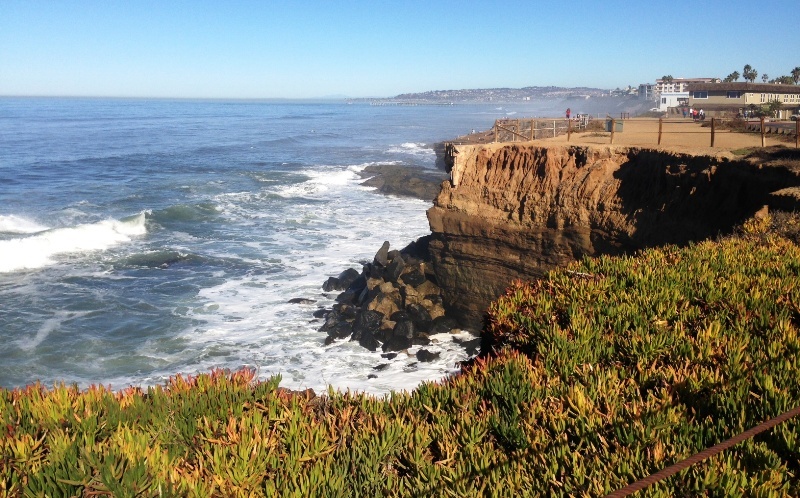 A woman was injured after diving off a cliff at Sunset Cliffs, at Osprey Point. The 52-year-old woman jumped head-first from the cliffs and hit her head on the bottom. Bystanders pulled her from the water, and lifeguards and paramedics checked on her condition. Emergency crews airlifted her to a hospital with possible spinal injuries. A group of three men nearly drowned after two ran into the water dressed in jeans near Hill Street and Sunset Cliffs Boulevard. The two soon ran into trouble and began fighting through the large surf and strong rip currents off the cliffs, and began screaming for help. Another man in his mid-20s, rushed in to help them but got caught up himself, becoming the worst off. One man was taken away by helicopter, another was lifted out by a large yellow crane poised on the cliffs and the third was carried out by stretcher. All three men were considered near drowning victims by authorities, Apparently out of town visitors, they showed up and were unprepared for the dangerous waves at the bottom of the dangerously steep cliffs. At last check, two of the victims were in serious condition according to officials. The third was able to walk up the cliffs after the rescue. Lifeguards used a crane to haul two teenage boys out of the pounding surf after they jumped off a cliff in Ocean Beach along Sunset Cliffs Boulevard near Froude Street. They were being dashed against rocks and weren’t able to swim to safety on their own. Barry Ault, 72, succumbed just days after he fell ill on Dec.23rd after surfing southern Sunset Cliffs less than 3 days after a large storm. His death was due to a highly aggressive form of staph caught while surfing. Local Kyle Witkowski was the victim in a fatal car crash off Sunset Cliffs during the early hours of Saturday, January 3rd. Kyle was killed and the female passenger seriously injured when his Chevy Tahoe missed the turn at the end of Bacon Street and flew off the cliffs, going through the guard-rail and fence and landing upside down on the rocks below. A surfer was rescued after being smashed against the jagged rocks of Sunset Cliffs. Rescuers say the man got into trouble when he tried to leave the surf, and was was hit repeatedly by sets of large waves that sent him crashing into the rocks at the foot of the cliff. Crews had to use a hoist to pull him to safety. Lifeguards say the surfer suffered cuts and bruises but was otherwise okay. One rescue involved a surfer who fell onto some rocks at Sunset Cliffs. 2 people were rescued. A woman was injured when she fell 65 feet down a cliff at Sunset Cliffs in the area of Hill Street and Sunset Cliffs Boulevard. The 50 year old woman was airlifted to a hospital, having suffered serious head, neck and back injuries, but was conscious and talking when crews came to her rescue, according to reports from the scene. A teenage girl was injured when she slipped on the reef at Sunset Cliffs. San Diego Lifeguards pulled the girl, 15, from the water and up the stairs onto Ladera Street near Sunset Cliffs Boulevard. She suffered a leg injury and was taken to UCSD Hospital for further evaluation. 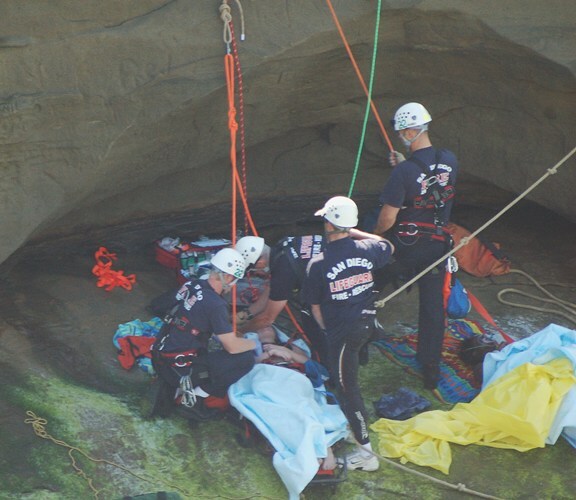 August 7, 2015 – Man rescued after jumping off Sunset Cliffs. Lifeguards were called out to Sunset Cliffs to rescue a man who was injured while cliff diving. A man landed facedown in the water after leaping from the cliffs and the jump knocked him unconscious. Bystanders rushed to pull him out of the ocean. By the time rescuers arrived, the man was alert and talking. Lifeguards, who strapped the patient in a stretcher, had to use a crane to lift him from the rocks. He was taken to the hospital for unknown injuries. A man, 31, was intoxicated and ignored several “Danger Stay Back” barriers along the cliff when he fell at 4400 Ladera Street. Several people found him unconscious at the bottom of the cliff, and he was severely bleeding from a serious head injury suffered in the fall. San Diego Fire airlifted him to UCSD Medical Center. He was reportedly awake, but did not remember the fall or even his own name. Brian Wilson, 23, went missing near Sunset Cliffs while swimming with a friend when he disappeared in the waters near Santa Cruz Avenue. His body was found in the area two days later. 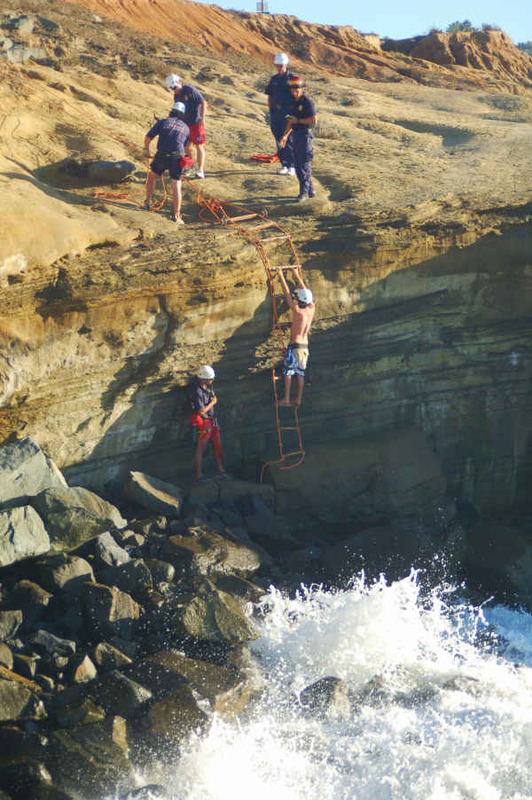 Lifeguards rescued an injured man after he jumped off a bluff into the ocean at Sunset Cliffs, a spot popular for cliff-jumping even though it is illegal. The jumper, who appeared to be in his 20s, had done a flip and hit the water face-first. Lifeguards secured him onto a backboard from a rocky outcropping below the 20-foot cliff, and hauled him up. The rescue took about half an hour, and he was taken to a trauma center by ambulance. A 49-year-old surfer slipped, hitting his head on a rocky edge along the cliffs near Osprey, on July 23rd, as he was getting out of the water and was knocked unconscious. When first reponders arrived, they found him being held up out of the water on the rocks by a friend. At that point, he didn’t have a pulse. CPR was performed and he revived. An air ambulance hoisted him from the cliffs and flew him to a nearby hospital. A man died on the beach below Sunset Cliffs. His body had been seen by a passerby who notified Fire-Rescue Department who then discovered that he died on the beach after tumbling at least 50 feet down the cliffs. Emergency crews tried to revive him, but he was pronounced dead on the beach. Over the course of these 13 years, from 2005 through 2017, there were 19 deaths and 49 people seriously injured from or in and around Sunset Cliffs and its waters. That’s 5 deaths or serious injuries every year. Many of the cliff falls occurred near Osprey Street (the Arch) or Ladera Street at the end of the paved road. Many of those who were victims of the cliffs were from out of town. Just made an addition to the year 2010 – apparently there was an injury, on July 19, lifeguards had to pull an unconscious man from the surf. There are signs staying unstable Cliff stay back. It’s not the sea, the ocean has nothing to do with it. The problem is people falling off the cliffs because they are drunk or stupid or they ignore warnings from locals. I agree with Geoff page but then there are also stupid teens trying to be cool by going off the trail.